DID YOU KNOW THAT THE HUMAN BODY IS INHABITED BY TRILLIONS OF MICROBES? 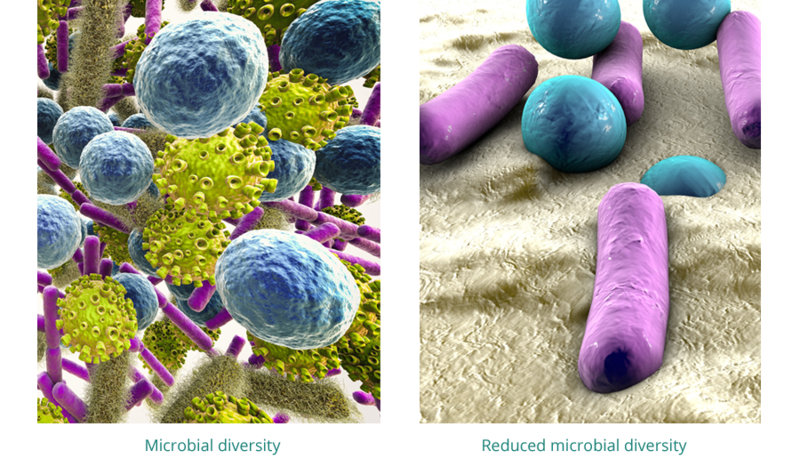 THESE MICROSCOPIC SPECIES ARE PART OF WHAT MAKES UP THE MICROBIOME. The microbiome is made up of a large variety of bacteria and other microorganisms that have a range of characteristics and functions. These species create a sort of ecosystem in a number of human tissues including the skin, mammary glands, placenta, seminal fluid, uterus, ovarian follicles, lungs, saliva, billary and gastrointestinal tracts. The different species of microbes, which also include genes of these organisms, all play different roles. It is possible to lose some of these microbes, leading to a decrease in microbial diversity. In the last two decades, there has been an increased interest to uncover the power of the microbiome worldwide, leading to advancements in understanding its role in the human body. Although everyone acquires their microbiomes from birth, not all microbiome compositions are alike. Research shows that microbial composition can vary from person to person, with some individuals having more bacterial diversity than others. Changes in diversity can be linked to dietary habits, certain medications or other environmental factors.